Diana Rocco reports a car slammed into a pump at a Queens gas station. 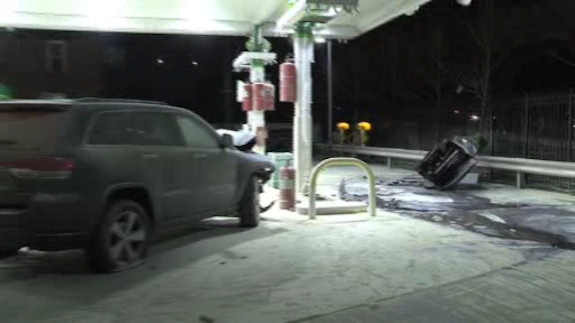 JACKSON HEIGHTS, Queens (WABC) -- A driver slammed into a gas pump in Queens Monday night, setting off a wall of flames. Police say the driver lost control and jumped a curb just after 8 p.m. at 68-22 Northern Boulevard in Jackson Heights, hitting the pump. It set off the station's emergency fire suppression system, which released a white powder to extinguish the flames. People standing nearby ran for cover, not sure what was going to happen next. "The car hit the gas station and it started getting on fire, I'm still shaking because of that," said eyewitness Michael Mallh. The gas station remained taped off and closed down Tuesday morning. The driver only suffered minor injuries.